A sample of cells taken from the inside of the nose could be used to indicate the damage caused to cells in the lung by smoking, a new US study has found. CT scans can identify suspect lumps in the lungs, but they can’t determine which of these lumps are likely to be cancerous, and those that are non-cancerous which should just be monitored. Researchers at Boston University School of Medicine (BUSM) in the US have now discovered that looking at certain genes within nose cells could help make a decision on which lumps to investigate further. In the US long-term smokers, who are at high-risk of lung cancer, are offered CT scans to screen for the disease. But at the moment a biopsy is needed to differentiate between non-cancerous nodules and lung cancers, so scientists are looking to develop non-invasive ways to aid diagnosis. If confirmed in larger studies the findings of the latest study could spare some US patients who have been given a CT scan from a costly and potentially risky surgical biopsy. Lung cancer screening is not available in the UK. A large European trial, the NELSON trial, may help clarify the benefits and harms of lung screening when its findings are published, and the UK National Screening Committee has said that it will review its policy based on these results. Dr Avrum Spira, lead researcher on the US study from BUSM, said there is a “clear and growing need” to develop diagnostic tests that can help distinguish those who need invasive tests and those who should be monitored instead. The research, which is published in the Journal of the National Cancer Institute, is based on previous work by Spira’s team which found that a genetic ‘signature’ in lung cells, caused by long-term tobacco smoking, could potentially tell apart patients with lung cancer and those with a benign nodule in their lungs. 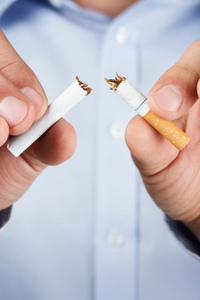 As long-term tobacco smoking similarly alters genes in the nose, the team looked if sampling cells from this area could offer the same information without the need for invasive lung sampling. The team looked at more than 550 nasal samples from current or former long-term tobacco smokers with suspected lung cancer, identified by CT scans that showed suspicious nodules. The researchers found that they could detect lung cancer-associated genetic changes in both nose and lung cell samples, and that these could help predict the risk that the patient had lung cancer. The team concluded that sampling nose cells could be a non-invasive way to aid the detection of lung cancer in high-risk patients.